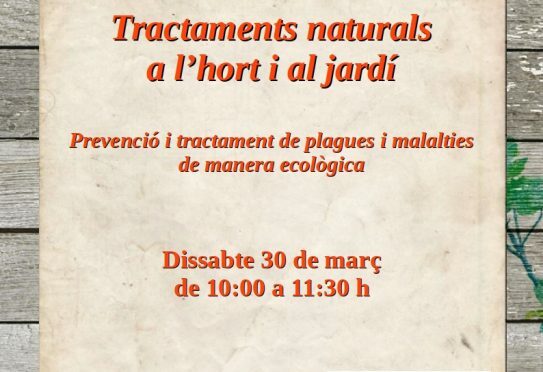 This Saturday, 30 March, at GOB’s Es Viver, we will have a practical workshop on how to prevent and treat, in an ecological way, the pests and diseases of the garden and kitchen garden. What are the principal treatments, how to prevent and apply them, in order to keep gardens healthy. The workshop is open to all, is free and no reservations are required. Ecological cultivation is based on strengthening all the relations between the species in the soil, accompanying plants and beneficial insects in order to obtain healthy gardens and products. There are positive ways of promoting all these aspects and for strengthening the defences of our plants. Preventive treatments also exist to avoid us getting these diseases and sicknesses. And when, unfortunately, we are affected, we can use ecological treatments, without chemical contamination. All these questions will be discussed on Saturday. This worksho is open to all is free and no reservations are required. It will start at 10 am.